Just sharing some news released at 2:26 p.m. today by the Chicago Archdiocese. Chicago, IL (May 23, 2014) – Rev. John M. Cassidy, died on Wednesday, May 21, 2014, at Buckingham Pavilion in Chicago. He was 82 years old. M.A. degrees from St. Mary of the Lake. His first assignment was at St. Raphael Parish in Chicago where he served as assistant pastor from 1958 to 1966. He also served as assistant pastor at Our Lady of the Snows in Chicago from 1966 to 1968 and St. Thaddeus Parish from 1968 to 1973. Fr. Cassidy was assigned Pastor of St. Ambrose Parish from 1973 to 1985. He was then named Associate Pastor at St. Margaret of Scotland from 1985 to 1987 and St. Daniel the Prophet Parish from 1987 to 2003. In 2003, Fr. Cassidy returned to St. Ambrose where he was named Pastor Emeritus. Fr. Cassidy also served as a chaplain in the Illinois National Guard with a rank of First Lieutenant. When asked about his long-time friendship with Fr. Cassidy, Deacon Richard Voytas from St. Daniel the Prophet Parish, he instantly described him as “not only a wonderful man but a priest 24 hours a day, seven days a week.” A family friend for over 20 years, Deacon Voytas said that Fr. Cassidy was not only a great inspiration and a mentor to him in his formation as a Deacon, but was devoted to the people of his parish. “When you look up the definition of ‘priest’ in a dictionary, you will find a picture of Fr. John Cassidy!” said Voytas. Fr. Cassidy was also well known throughout his lifetime for his athletic abilities. “He was a marvelous athlete who loved golf but was simply great at basketball, racquetball and handball. He was a natural,” remarked Voytas. .
Visitation for Fr. Cassidy will take place from 3 p.m. to 9 p.m., on Monday, May 26, at St. Daniel the Prophet Parish, 5300 South Natoma Avenue in Chicago. 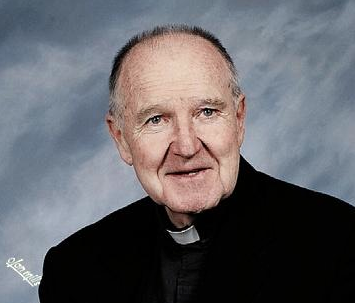 Bishop Francis Kane will be the main celebrant at a funeral Mass for Fr. Cassidy at 10 a.m. on Tuesday, May 27, at St. Daniel the Prophet Parish. Deacon Richard Vojtas of St. Daniel the Prophet will be the homilist. Interment will be at Holy Sepulchre Cemetery in Alsip. Father John Cassidy is the brother of the late Rev. Francis Cassidy, Mundelein Seminary Class of 1957. Fr. Cassidy is survived by his older brother James and James’ wife, Donna. Rest in peace, Fr. Cassidy. He was a genuinely nice, warm, kind-hearted man. He made the world better and will be missed.